I have some super exciting news! 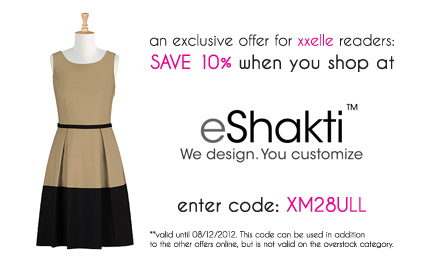 eShakti has been kind enough to offer an exclusive discount to xxelle readers! You can SAVE 10% when you shop at eShakti from now until August 31st, 2012. Enter the code: XM28ULL upon check out. The discount is valid on other offers online but is not valid on the overstock category. In case you haven't heard of eShakti before I think you should know that it's pretty much amazing. I had one of their dresses on my convocation wishlist and have owned a few key pieces in my time. The best part about eShakti is that they have sizes ranging from 0-26 and offer customization (which is a dream for the extreme pear shapes of the world). Customization is currently free! This comes just in time for their fall preview! Soooo many pieces I'm lusting over. ps. The dress pictured above is the Red-Hot Colorblock Dress, if you have any questions about the discount or eShakti please feel free to post them below and I will respond asap!